Tulsa BOTOX - Dr. Paulsen of Plastic Surgery Associates of Tulsa is one of Tulsa's leading BOTOX injectors. Dr. Paulsen is the only doctor in Oklahoma that serves as part of the national medical education faculty lecturing and teaching other physicians about the administration of Allergen products including BOTOX. As a plastic surgeon he is uniquely trained in the aging face which allows him to perform facial rejuvenation with results that make the patient look refreshed and rejuvenated rather than recently injected. 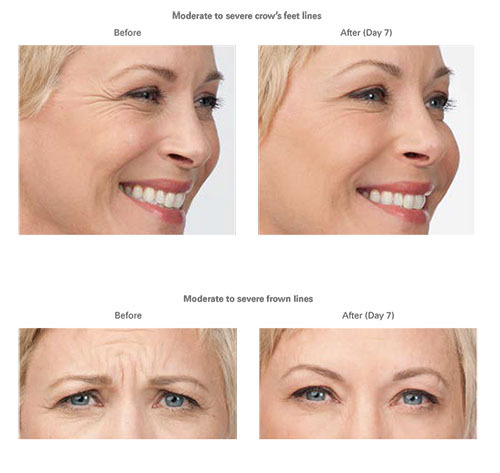 Scroll to the bottom of the page to see our interactive BOTOX widget to better visualize the difference a BOTOX treatment can make to your appearance. Dr. Paulsen performs all injections himself ensuring you have the highest quality care in the safest environment. Why BOTOX®? BOTOX® treatments are a quick and simple approach to looking instantly younger. To note, BOTOX® is a perfect complementary procedure if you are undergoing a cosmetic surgery. The FDA-approved treatment is becoming a popular option for younger clients over age 18 as a wrinkle preventative. For over a decade, BOTOX® has been a proven agent in anti-aging for millions of patients. According to the American Society of Plastic Surgeons, over 8 million BOTOX®-type procedures occurred in 2013. BOTOX® patients, both men and women, ranging in ages from 18+, require less than an hour for the procedure. Results may last up to four months. What is BOTOX®? BOTOX® is a form of Botulinum Toxin Type A and safely weakens muscles when used in small dosages. The nerve signal running from the motor neuron to the muscle is blocked. Without exaggerated muscle contraction, formation and appearance of wrinkles decrease providing a more youthful appearance and preventing the enhancement of existing lines. Where is BOTOX® administered? The injectable prescription is used to mend lines primarily between the eyebrows (frown lines), on the skin surrounding the outer eye (crow's feet) and other areas such as forehead lines.